…which evaluates as 0 (zero) when the current script is “Other Script”; otherwise it evaluates as 1. Next I added some new steps at the top of Trigger Script to instruct it to bail out if necessary. …and problem solved. But… not optimally, because what happens if I realize “Other Script” isn’t the ideal name for that script, and decide to rename it? More often though, brittleness can occur when we refer to objects by name, via functions such as, but not limited to: Get(LayoutName), Get(ActiveFieldName) or, as per my script parameter above, Get(ScriptName). Well it turns out that a Belgian FileMaker developer named Fabrice Nordmann has written a custom function, FM_Name_ID, that can translate almost any FileMaker object name into its corresponding internal id… and vice versa. That’s right, this one CF translates in both directions: input an ID, you get back a name; feed it a name, out pops an ID. I’ve been working with internal layout ids in various ways for many years, but it never occured to me that a single custom function could be used for both encoding and decoding. It’s a great idea, and I wish I would have thought of it. …which, admittedly, is not as readable, but is certainly more robust. As Fabrice suggests, it’s a good idea to add a comment like “// Other Script”… though truth be told, it’s not much work to throw FM_Name_ID ( 341 ; "S" ; "" ; "" ) into the Data Viewer if you can’t remember what script you were referring to. One of the things I love about custom functions is the open-source nature of them, and if I’m going to use a CF, I want it to have as few arguments as possible, and I also want to be able to use it without having to give it much thought. So, I decided to spawn a few “baby” (single-purpose) versions from Fabrice’s mothership CF for my own use, which incidentally, you can find, along with Fabrice’s original CF, in today’s demo file: CF-Sandbox. Incidentally, I did include one original CF in today’s demo file; it’s called FNO, which is short for “field name only” — basically, it’s the GetFieldName function minus the “table::” portion. …and now I can rename “organization” to “business”, “department”, “division”, or what have you, with a 100% clean conscience. In the comment section below, Geoff Gerhard offers an alternative method to solve this problem. I have updated this article’s demo file to include his approach, which I actually prefer to mine. Thanks for sharing your thoughts on this–I’ve been thinking about the issue of “brittleness” in the context of data/meta-data/structural/procedural abstractions and had not seen Fabrice’s CF. Very nice, Geoff. Your example definitely solves a problem that could arise from time to time, and one that I’d overlooked. Thanks for taking the time to write that up. And I also added an example showing how to use it. Always nice to see good code on the interwebs! I’ve been personally using Fabrice’s function since it was named ObjectId. To simplify your code even more, we’ve created a best practice suggestion over at filemakerstandards.org. 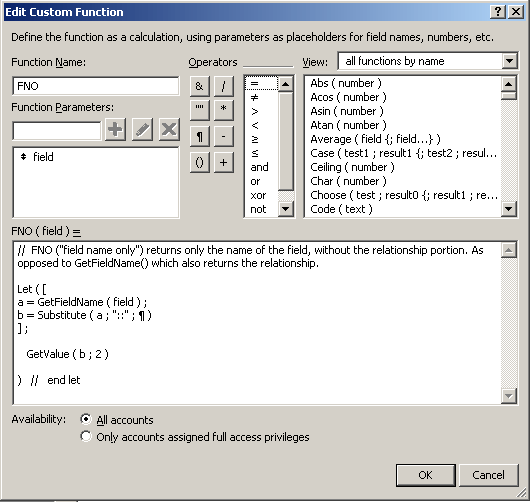 Essentially, you reserve the use of the FM_Name_ID() function for internal use (a private function) within the Custom functions area and then create wrapper functions around it. The code can become quite readable and easy to maintain. Something as clear as this reads great! Another great post with lots cool stuff. I like that you broke Fabrice’s brilliant code into separate (single-purpose) versions. You might want to split the version for Layouts into 2, i.e…..
might use the same LayoutName more than 1 time in the same file. Thanks for taking the time to comment. You are correct as usual.